From the striking architecture that typifies Ulaan Baatar, soviet concrete tower block, to the sweeping steppe and the ever present ger, this journey is a wondrous experience. Big in every way, Mongolia is one of the few places where humans are still in awe of their place in the world. 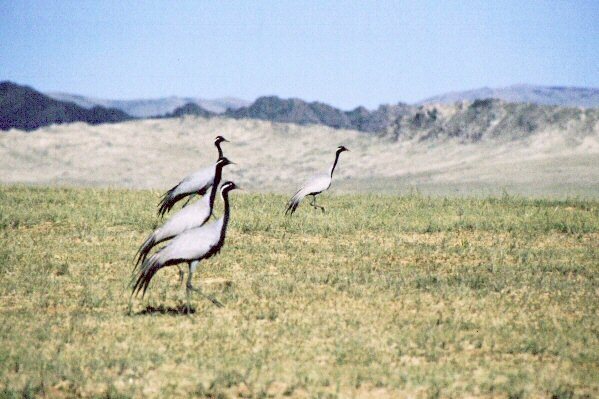 Our itinerary follows an arc south and west of Ulaan Baatar via Khara Khorn (Karakorum) and then curves back east to a ger camp south of Ih Bogd Uul. From here we visit the Flaming cliffs made famous by Roy Chapman Andrews adventure / scientific expeditions in the 1920s and 1930s. Our visit will coincide with the Naadam festival in Ulaan Baatar. This is an incredible Mongolian equivalent of the Olympics. The opening of which is well worth visiting for the wrestling, archery and knuckle bones, a very particular Mongolian passion. In Mongolia as elsewhere, an abundance of patience goes a very long way to improving your experience. Even the most carefully organised itinerary may go awry. There can be long hours driving on appalling roads; the hotels are not particularly luxurious and the climate is variable... all of these things contribute to our adventurous Mongolian journey. We run this tour every two or three years according to demand. We are going in July 2004. And with sufficient demand will go in 2005, at around the same time. Please make contact if you are interested.. The day after arriving in Ulaan Baatar we leap straight into Mongolia's largest festival - the Naadam. Horse racing is taken very seriously and is truly spectacular. Several thousand people on horseback jam the finish line. All hoping to touch the winning horse. To do so is considered a lucky omen. The horse races follow wrestling in open fronted jackets. The jacket's fronts were removed to avoid a woman ever becoming the national wrestling champion again. Archery and knuckle bones make up the other "manly" sports of the Naadam. Whilst in Ulaan Baatar we also have the opportunity to see Mongolia's best folk dancing groups as well as hear throat singing, which is a personal highlight. This is of course a passion that Mongolia shares with Tuva, just across the border to the north. Further west we visit the Khogno Khan mountain range and it's abandoned monastery. A wonderful opportunity to walk through stone outcrops not unlike those evoked by Frank Herbert in his novel 'Dune'. Interesting history in a stunning setting, and our only hedgehog siting in Mongolia so far. There's time here for horse riding, rock scrambling or hiking in and around our Ger camp. Karakorum (Khara Khorin) is our next stop. In 1220 AD Genghis Khan based the capital of the Mongolian empire here. Kublai Khan moved it to present day Beijing some 40 years later. Though it was only the capital for a short time Karakorum symbolises mongolia's remote and exciting nature. Mongolians make this journey special. Even in the poorest and most isolated areas we've been greeted by wonderful hospitality and company. Along the way I'll organise some 'Airag' (fermented mares milk) or Mongolian beer. An unusual drink the locals love to share. It's amazing how everyone's foreign language fluency improves. Further south again we enter the Gobi desert proper. 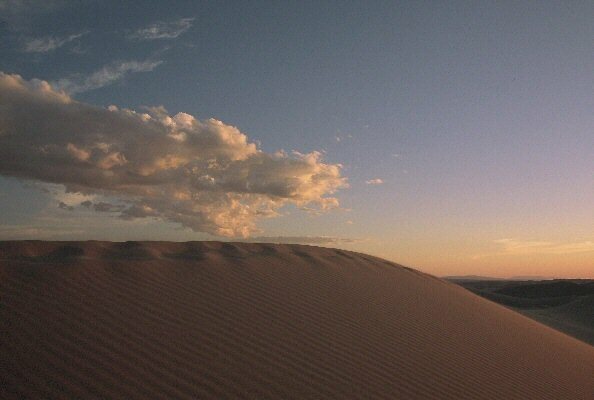 Home to camels, vistas that go on forever, dinosaur bones, wildlife and petroglyphs. 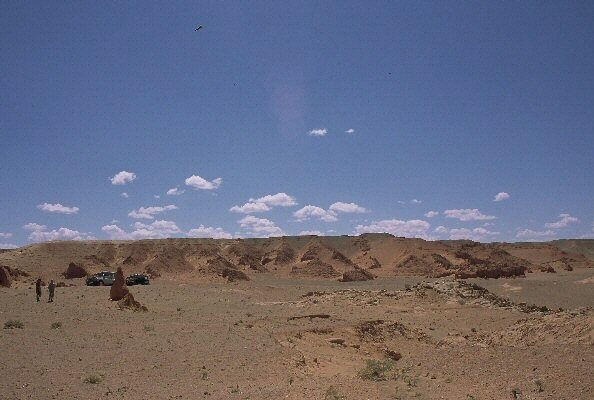 We visit the area around the Ikh bogd uul range where we will see evidence of human habitation from the middle Palaeolithic period [60,000 years ago: ref]. 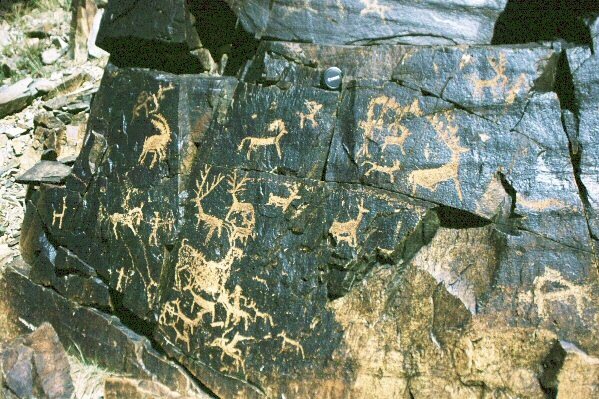 There are numerous sites where we see petroglyphs from the Bronze age [3,000 to 4,000 years old ref]. We could also stumble upon bronze age square standing stone graves (ref) or tumuli from other periods. 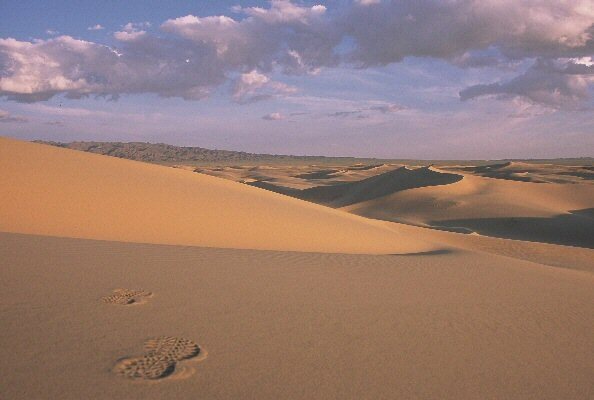 From Ikh bogd uul we head east to the singing sands of Khongoryn els a large area of sand dunes and saxaul forest. The saxaul tree is a favourite food of the endemic Bactrian camel. Khongoryn els is where we have an opportunity for a ride on these imposing beasts. This area is also home to the Altay Argali sheep, who are one of the largest and most elusive breeds in the world. Khongoryn Ells means singing sands, an evening walk will give us the opportunity to match the name with the reality. A morning's travel away we arrive at the Flaming cliffs, made famous by Roy Chapman Andrews of the American Museum of Natural History (ref). 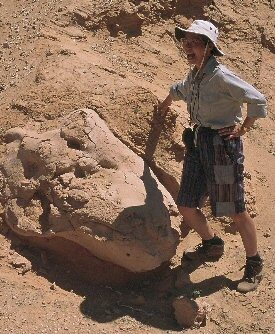 It was here that Andrews' team discovered the first fossils confirming that dinosaurs laid eggs. 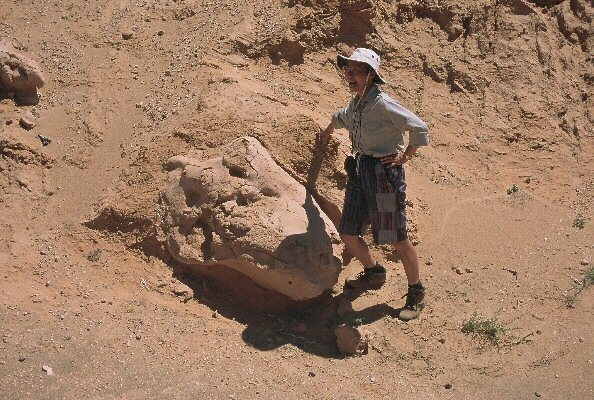 Today it is still visited by paleontological expeditions, though fossil sites to the south west have proved more fertile. Further east again we reach the area around Yolyn Am. This canyon in the southern Gobi is famous for it's year round "glacier" but should really be lauded for it's spectacular wild life. On the walk down the canyon we can expect to see picas, ibex and literally hundreds of other species. We then have the option of returning up the canyon or going on a rather steep excursion up the canyon wall to slum it with the ibex for a while. One of my favourite spots. Our last adventure in the Gobi is getting on the Mongolian Airlines flight back to Ulaan Baatar. In Ulaan Baatar we've got time to wash the Gobi from our bodies, to do that last bit of shopping and enjoy our final meal together before heading home. 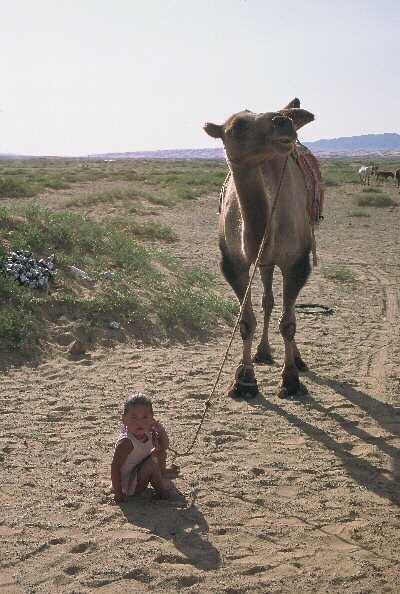 From such little things big things grow.The largest empire in the history of the world was created by a child who grew up much as nomad youngsters do today. 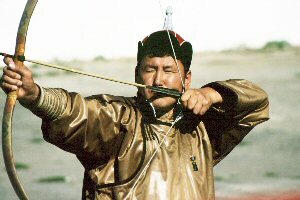 Chingis Khaan was a warrior, philosopher and conqueror of the world. Born in 1167 AD as Temujin he received the honorary name Chingis Khaan ('universal or oceanic-ruler') in 1206 AD. Declaring 'I am the punishment of God...' he created the largest empire ever, and it was said of him that "and death floated in the air behind his armies". From the arctic to Tibet, and the sea of Japan to Hungary, he ruled supreme until his death in 1227 AD. Mongolia is an amazing mix of east and west. The language is a member of the Ural-Altaic family of languages, and the downward-script is the result of Kyrgyz' influences around 840 AD. It was this script with which Chingis Khaan wrote 'The Secret History of the Mongols' establishing law and order for the tribes. His grandson Kublai Khan (ca 1216 to 1294 AD) became the emperor of China's Yuan dynasty. A great ruler and open minded thinker Khublai stabilised his empire, improved communications, introduced paper money, and provided the back drop for Marco Polo's stories, so unbelievable in Europe of the time. 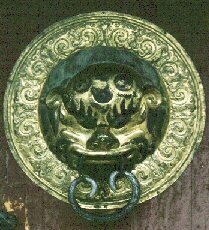 The Ming dynasty (ca 1368 to 1644 AD) saw the end of Mongolian rule in China. With the rise of this dynasty self determination ended in most of the area we now know as Mongolia. With the downfall of the Quing Dynasty in 1911 AD the Mongolian's created an independent state. World events, particularly the Russian revolution saw Mongolia coerced into becoming the second communist state in the world. Mongolia's new ruler Choibalsan mimicked Stalin in many ways. His rule was also characterised by purges, especially against monks, tens of thousands of whom were murdered. With the collapse of the Soviet block, a major capital investor and buyer of Mongolia's products, democracy rapidly came to the fore. The first democratic elections were held in June 1990. How physically demanding is this tour? How many people will go? A ger is the traditional form of dwelling in Mongolia. It consists of a wooden frame covered with one or two layers of felt. The felt is covered with an outer skin of canvas to provide protection from rain. 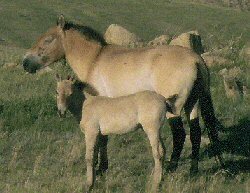 You will see gers in Ulaan Baatar and out on the steppe. No matter where the ger is they're all arranged in much the same way. The entrance faces south, the west side is for males and the east side for females. The most important possessions and guests are placed in the North West part of the Ger. A central stove provides warmth and heat for cooking. Items considered to be male like saddles and airag (fermented mares milk beer) bottles are kept on the west side. Items like the house-hold utensils are to the east. 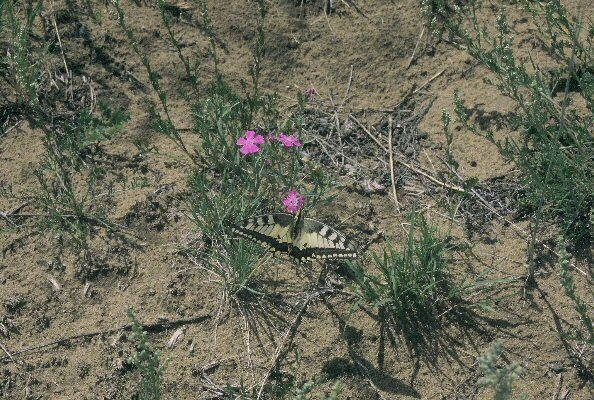 Though small they are particularly well suited to Mongolian conditions. In the hot months the ger's "skirts" can be lifted allowing breezes through whilst still providing shade. In the winter the ger's "skirts" can be dropped down and covered with snow, ensuring the ger is wind proof and warm. In Ulaan Baatar we stay in medium grade hotel accommodation. In the countryside we stay in ger camps. 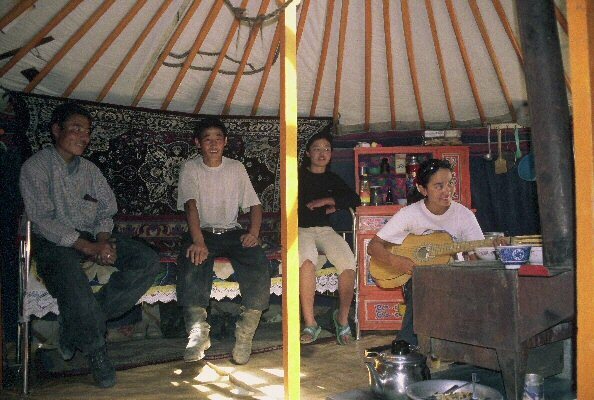 A Ger camp is the Mongolian equivalent of a motel. Normal family sized gers serve as individual rooms with two to four beds per ger. The accommodation gers are accompanied by a dining room ger (about four times normal size) and an ablution block, with shower and toilet facilities. This visually and ecologically elegant solution to housing numbers of people makes the most of local crafts, talents and materials. Mongolians have a reputation for only eating meat. Surprisingly Mongolia is also vegetarian friendly, in part due to Russian influence. This influence translates into clean and filling meals no matter where you eat in Mongolia, be it in the capital or out in the country side. Staples like rice are imported from China while grapes and watermelon make their way east from the central Asian republics. The fact that these foods exist seems to elude the notice of some locals. On my last trip one person greeted me "so you're the people who eat vegetables eh ?". Mongolia isn't a shoppers paradise, malls haven't made their way here yet. There is however the very best type of department store in Ulaan Baatar. A multi story marvel it sells everything one might want, from vehicles and plumbing supplies to knives and saddles. 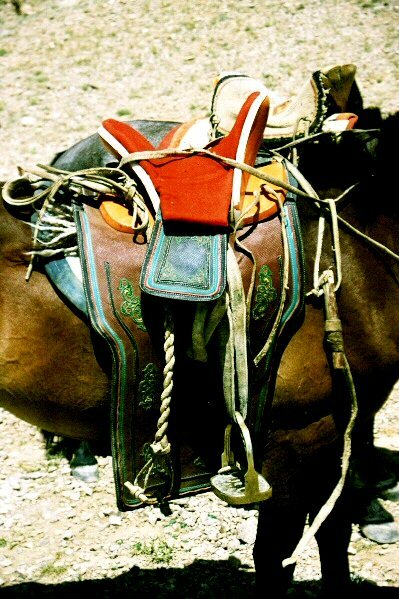 Local crafts tend to be utilitarian; leather, felt, clothes, and horse related items. There is however a thriving business in water color paintings of Mongolian scenes and of course Genghis Khan. One of my most inveterate shopper friends came with me on our first foray to Mongolia. She found more than enough to keep her occupied. Come prepared to sieze your shopping opportunities when they appear. How physically challenging is this tour? 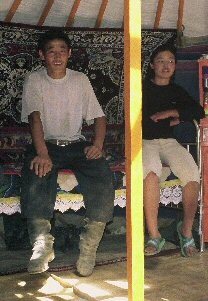 This journey is primarily focused on gaining an overview of Mongolia. Being such a vast country this takes a bit of doing. In our case we travel in modern Uaz jeeps. This means that everyone has a reasonable seat and a good view, rather than being crammed into the back of a Uaz van with small windows. Uaz jeeps are what the locals use, should we need spare parts, they're available. 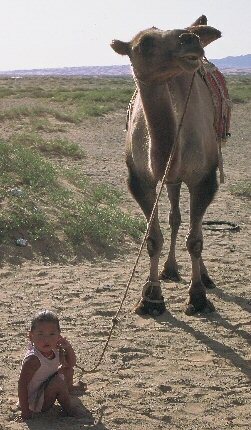 Daily walks, horse and camel rides provide some of the other physical challenges. With these realities in mind, a reasonable level of fitness will improve your experience greatly. We specialise in small group travel. Because of the places that we go and our preferred method of travel (jeep) this journey is for no more than eight clients. Although we don't anticipate any problems, there are sure to be some! Mongolia is a world apart. Isolated for almost 70 years from the western world, it is one of the poorest nations on earth, so don't expect sophisticated infrastructure. As such Mongolia's medical facilities are limited, though improving year by year. You should make sure that your travel insurance covers medical evacuation to a first world facility outside Mongolia. Please check that your travel insurance policy covers helicopter evacuation from the site of the accident to an international airport, and from that airport to your home or other major western medical center (Hong Kong or Singapore in this case). We recommend and use the Mike Henry insurance available through House of Travel. Don’t let the feeble excuse of work keep you back; remember the Haitian proverb: If work is such a good thing, how come the rich haven’t grabbed it all for themselves ? What other information do you send? Please note: These prices are not final, we reserve the right to make changes should major movements occur in currency or airfares.N.B. If you choose the land-only option please organise your air travel early. Flights to and from Asia are very heavily booked. I am happy to help with suggestions and flight bookings if you wish. What shall we tell you? Tales, marvellous tales, Of ships and stars and isles where good men rest, Where nevermore the rose of sunset pales, And winds and shadows fall toward the west. Those who wish to travel elsewhere in Asia or travel on to Europe may prefer this option. What do you get...and, what you don't get? A personal introduction to some new places and interesting people! · Return economy airfare from Christchurch, Wellington or Auckland to Mongolia · Twin-share accommodation in all cities · Breakfasts everyday · lunch and dinner while outside Ulaan Baatar,· Airport transfers and departure tax in Mongolia.·Ground transportation in Mongolia, translator and guide. NZ departure tax · dinner, unless mentioned · personal insurance and medical expenses · excess baggage charges · items of a personal nature and items not explicitly mentioned by Footprints. On this trip you’ll take time to visit some a truly special place. Mongolia, the experience of a lifetime. will you ever get your hands on it again? If you would like more information about a specific trip please email your wishes and we shall respond. If the timing of this trip does not suit, and you would like us to arrange a tour for your own independent group check out what we offer.